with your 2006-2007 state officer team. 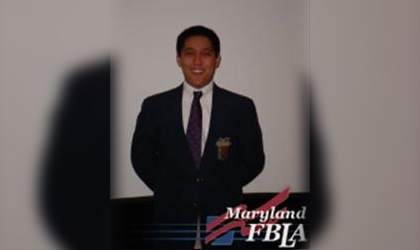 Jonathan Ko is proud to serve as your 2006-2007 Maryland FBLA State President. He has previously served as your 2005-2006 State Vice President as well as other positions in his chapter. Jonathan has received many awards on the Regional and State level for Parliamentary Procedure. In addition to FBLA, Jonathan is involved in the Student Government Organization, National Honor Society, and the Varsity Tennis Team. Jonathan plans on going to college to receive his medical and business degrees. 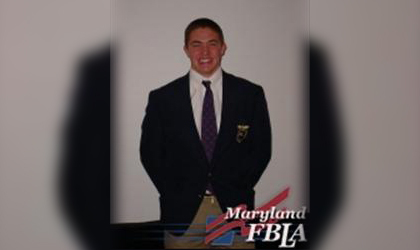 During the 2006-2007 term, Jonathan hopes to raise membership to new levels, create new FBLA programs, increase Maryland recognition on the national level in order to ensure Maryland’s Future Business Leaders success for years to come. Milan is a senior at River Hill High School in Clarksville Maryland. He is honored and delighted to be able to serve as the Maryland State Vice President. Returning for his second term in state office Milan hopes to bring experience and expanding ideas to help make Maryland reach its full potential. Milan is interested in business organization and management as well as general science. He has held a passion for science since he was young and even interns at Johns Hopkins University working on a project which he has won several science fair awards with. However, from the moment he joined FBLA in 9th grade and won at the regional and state level Milan has grown to understand the business world and now wants to make business a part of his life. Milan is also currently serving as the FBLA National Secretary and his high school chapter President and feels that his working at all 3 levels will benefit the entire organization. 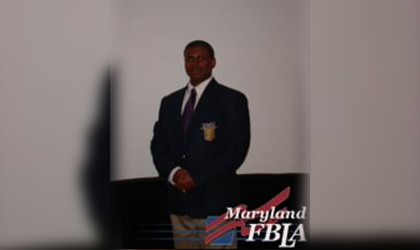 Reginald Benbow is proud to serve as your 2006-2007 Maryland FBLA State Secretary. 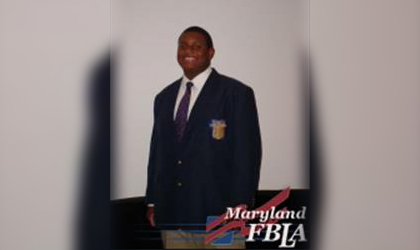 Reginald has been in FBLA since his freshman year and has taken advantage of the many opportunities FBLA offers. A senior at Parkville High School, he has been Chapter President since 2004. Reginald has consistently placed at the regional and state levels. 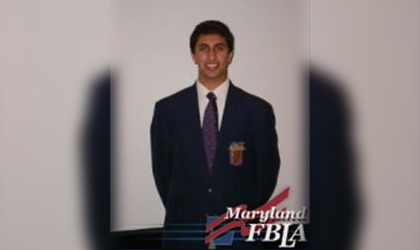 As Secretary he hopes to increase participation in FBLA programs, such as the BAA’s, and complete a winning State Chapter Annual Business Report in order increase Maryland’s recognition at the national level. He is very active in his school community, being class secretary, NHS VP, and Natl. Spanish Honor Society President. 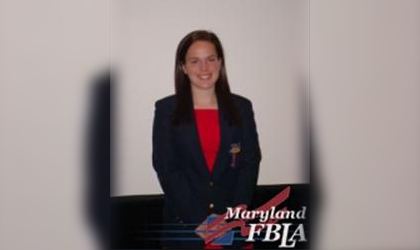 Jillian Feirson is proud to serve as your 2006-2007 Maryland FBLA Treasurer. She has previously served as Chapter Treasurer and is currently serving as Chapter Vice President at River Hill High School. Some highlights of Jillian’s FBLA career are her 2nd place award for Public Speaking and 6th place award for Entrepreneurship both on the national level. In addition to FBLA, Jillian is active in her high schools Student Government Association and Varsity Field Hockey and Track teams. 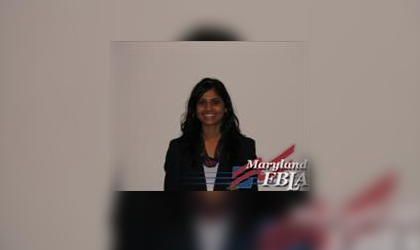 During her term as treasurer Jillian hopes to increase the funds available to the state office and maintain a balanced budget to provide a solid foundation for the future of Maryland FBLA. Elizabeth Ding is currently a Junior at River Hill High School. 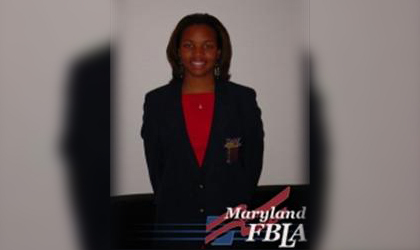 She is proud to serve as your 2006-2007 Maryland FBLA State Reporter. With plans of restarting the state newsletter and an increase in the number of active members, Elizabeth hopes to increase communication and participation within the state. Elizabeth is interested in international business and business management. She has consistently placed at the regional and state levels. 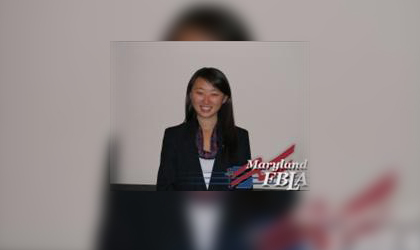 Since becoming a part of FBLA in the ninth grade, Elizabeth has harbored a deep passion for many different aspects of business and wishes to help the state of Maryland reach the pinnacle of her potential. As a junior at River Hill High School, Anita Ram is proud to be your new 2006-2007 State Historian. In addition to being her Chapter Treasurer, she has also placed on both regional and state levels for Word Processing in 2006. As well as FBLA, Anita is a part of the National Honor Society, varsity Outdoor Track team, and has been a classical Indian dancer since the age of ten. In 2005, she also attained her black belt from the American Academy of Martial Arts. As State Historian, Anita plans to accurately maintain the records of the state with hopes of helping you make the best out of your FBLA experience. Patrick Moran is proud to serve as your 2006-2007 State Parliamentarian. Patrick attends Chopticon High School where he is involved in a number of extra curricular organizations outside of FBLA, which include National Honor Society, Student Government Association, Class of 2007 leadership team, and the St. Mary’s County School Board. Athletically, Patrick is Captain of the Varsity Football, Indoor Track, and Track and Field teams. 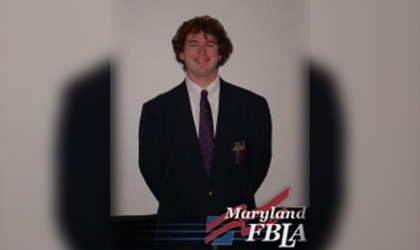 Over the past four years in FBLA, Patrick has competed in FBLA Principles and Procedures, where he placed forth nationally at the 2005 NLC, and Parliamentary Procedure team which placed first statewide at the 2006 SLC. 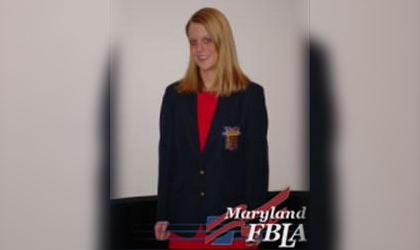 Katie Gonder is proud to serve as your 2006-2007 Maryland FBLA Region I Vice President. Katie is a senior at South Hagerstown High School. In addition to FBLA Katie is also involved in the Student Government Association, National Honor Society, the Honor Club, and the Fellowship of Christian Athletes. Katie plans on going to college majoring in business administration/management. Katie is very active in FBLA and will be very dedicated to her position. Katie will strive to enhance communication in Region I between chapters, advisors, herself, and other state officers. She also plans to increase membership by starting new chapters, activating inactive chapters and maintaining current chapters. Katie looks forward to being the 2006-2007 Region I Vice President and hopes that she will be able to make a strong impact on Maryland FBLA. 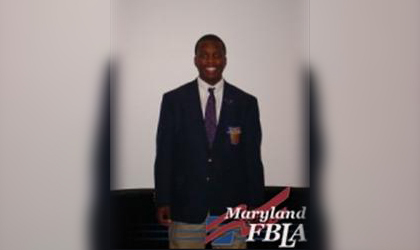 Geoffrey Long is excited to be serving as your 2006-2007 Maryland FBLA Region IIA Vice President. Ever since transferring from Parkville High School to Catonsville High School. Geoffrey has served as Chapter President for the past two years. He has competed at the 2006 regional leadership conference where he took 4th place in Public Speaking 2 and has competed in several open events at the national level such as Sports Marketing and Leadership. He hopes to improve communication and bring local, state and national media coverage to the conferences. Other than FBLA Geoffrey is apart of the CHS Rising Scholars and is serving as SGA Secretary and sports broadcaster. After High School Geoffrey plans to attend Cleveland State University where he plans on double majoring in Mass Communications and Sports Management with a minor in History. He is proud to be working with 13 other individuals who share the same passion for this organization. Cory Connelly, your new Region IIC VP, is a senior at River Hill High School in Clarksville, MD. He aspires to get accepted into college, major in business and engineering, and go into the business world one day. In his spare time he plays golf, swims, and reads. He is a lifeguard during the summer at the River Hill Community Pool, and during the school year he is dedicated to his schoolwork and extracurricular activities. Cory looks forward to working with you and with the State Officer Team to make FBLA a great experience for everyone involved. Brandon Colbert is proud to serve you as your Region III Vice President. Brandon is a senior at Frederick Douglass High. Besides being immensely involved in FBLA, Brandon is involved in the National Honor Society, and plays Baseball and Soccer for his school. Brandon plans to go to college to major in chemistry, and then finish up by getting his doctors in Pharmacy. Brandon will be deeply involved in his job by stressing communication between everyone in his region. He also plans to start new chapters, as well as increase membership across the region. Brandon can’t wait to get started on being your 2006-2007 Region III Vice President, and looks forward to being the best he can be for you. 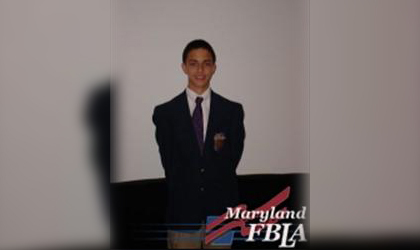 Jacob Dieguez is the Region IV Vice President for 2006-2007 Maryland FBLA year. He currently attends Chopticon High School in St. Mary’s County and is in the 11th grade. He has participated in competitive events since joinging his freshman year. In 9th grade, Jacob received 5th place in Introduction to Parliamentary Procedures at the regional level. In his sophomore year, Jacob received 1st place in FBLA Principles and Procedures at both the regional and state levels. He then went on to compete at the National competition in Nashville, Tennessee. As the Region IV Vice President, Jacob hopes to enhance communication within his region as well as within the state. He also hopes to increase membership and participation in his local chapter and other chapters in his region. Jacob is looking forward to a wonderful and productive year. Kiana Moaney, the Region VI Vice President, is a senior at Queen Anne's County High School and a very active member of FBLA. Kiana is the president of her local high school chapter. Besides FBLA, Kiana is involved in National Honor Society, Student Government, It's Academic, Spanish Club, and several sports. She participates on Varsity Soccer, Varsity Basketball, and Varsity Track & Field, where she holds a captain title. Outside of school, Kiana is the Youth Leader at her church. In her spare time she loves to bake, sing, go shopping, and hangout with friends.